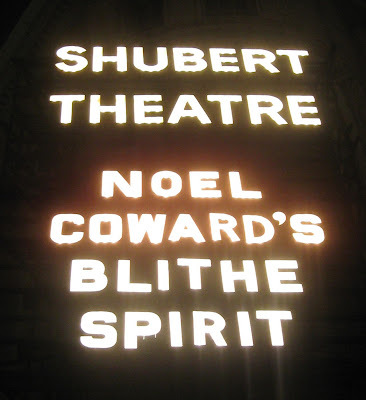 Adventures in the Endless Pursuit of Entertainment: Blithe Spirit: Highly Spirited! Blithe Spirit was everything I wanted it to be! The production is steeped in high style and high comedy, both physical and in wit. It's the story of a British widower who has remarried. He is an author and decides to hire a medium to do a seance after a dinner party as mere research for a book he's writing. Things don't exactly go as he has planned. The huge Shubert Theatre was mostly full and we practically raised the ceiling with laughter. Rupert Everett was terrific as the handsome remarried widower Charles. I enjoyed his performance very much. His British debonnaire translates very well and he looks terrific in a tuxedo. Jayne Atkinson as his second wife Ruth was perfect. In her wig and costumes, she was reminiscent of Helen Mirren! When Angela Lansbury entered as Madame Arcati, the medium, the applause was long and loud. She wore a red wig with braids pinned up on either side of hair - not as crazy looking as Mrs. Lovett, but still funny. She wore a little sparkley hat and costumes that made her look like a cross between glamorous old dame who's gone dotty and Eglantine from Bedknobs & Broomsticks. She was hysterical and her physical comedy was brilliant. I thought I would cry from laughing so hard. Plus, she looks absolutely fabulous. Christine Ebersole is lovelier than she's ever been as the ghostly Elvira. She holds a British accent fairly well and her delivery is spot on. It was so fun to see her on the Broadway stage again and doubly fun to see her in such a silly role. Simon Jones and Deborah Rush add atmosphere as friends of Charles and Ruth. Susan Louise O'Connor makes her Broadway debut as Edith, Charles and Ruth's inexperienced and nervous maid. She earned a good deal of the laughs all on her own. The set is gorgeous, as are the costumes. Each scene change is a curtain down and lights out with the special treat of Christine Ebersole singing songs from the 1930's & '40's. I hope they release the recording! Each character seems perfectly cast and the chemistry is great. They seem to be having a terrific time. Jayne Atkinson lost her composure when the chimes of the clock didn't quite go off. She began laughing and had to turn around in her arm chair, which made the audience join in on the laughter even more. It's a handsome cast for sure. I saw Rupert's standby, Mark Capri in the lobby before curtain. Wow, he's even more handsome than Rupert. Every minute is hysterical. I read the play last year to prepare, but seeing it live in such a terrific production just about did me in. My face hurts from smiling the entire time! I have opening night tickets, but I'm not sure I can wait that long to see it again! Sounds delightful - you've had quite a week, missy! This makes me sooo excited to see it!! It was truly wonderul. I had such a great time. I also find it difficult to wait until it officially opens. I may be seeing it again on March 13, and I'm only waiting that long because I need to receive another paycheck.